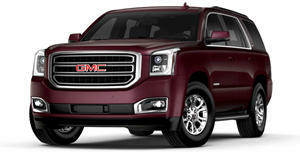 Imagine you want a big SUV, jam-packed with luxury, only not a Cadillac Escalade. That’s fine because the Escalade’s personality isn’t for everyone, and that’s why the GMC Yukon Denali exists. Same platform. Same engine. Same off-road capabilities. The biggest difference, however, is the application of luxury. Meet the new 2018 GMC Denali Ultimate Black Edition. It’s just like the standard Yukon Denali only it features new black-painted 22-inch wheels with chrome inserts, polished exhaust tips, chrome mirror caps and premium carpeted floor mats. Onyx Black is the sole exterior paint color. Power comes from the familiar 6.2-liter V8 that’s . Buyers can select either 2WD or 4WD. Other standard features include the Open Road Package that offers a nine-month trial of Sirius XM and NavTraffic, power sunroof and a rear-seat entertainment system. Because this is the very best of GM luxury and security, owners are also treated to power-retractable assist steps, an enhanced security package that includes door and liftgate lock shields, glass breakage sensors, interior motion detectors, and even a self-powered horn. The GMC Yukon Denali itself was refreshed last year, so the Ultimate Black Edition is a carry-over from the 2017 model, save for the added upgrades. Pricing and an on sale date haven’t been announced, but this fun tidbit was: GMC has teamed up with Little Damage, a soft-serve ice cream shop in LA. During the LA Auto Show, people can get the new Ultimate Black flavor topped with Denali chrome chocolate chips served in Little Damage’s signature black activated charcoal cones. So there’s that.